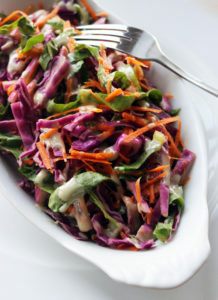 A fresh and crunchy salad, perfect for the warmer months. Optional: grated beetroot, goat’s fetta, spring onions or other allowable foods. Blend and add purified water until you get a runny consistency. Prepare the dressing and add to the ingredients, mixing the dressing through.